Beautiful scenery, dry climate, golf, racket sports and mid-century modern architecture is what the Palm Springs area is known for but today there is so much more. The area has had a resurgence and upon my last news shoot there a few months ago - one can see the boom and now there is just so much to take in. In 2011, a majority of voters approved a 1% sales tax increase just to revitalize downtown and maintain community services and now the fruits of those dollars are working. It is a desert oasis that I have always loved and with it being just a two hour drive from Los Angeles, it was the perfect weekend getaway but today it is now filled with new hip boutique hotels, new restaurants, activities that draw tens of thousands from all over the world and a modern face lift that is transforming the areas that make up the Coachella Valley. 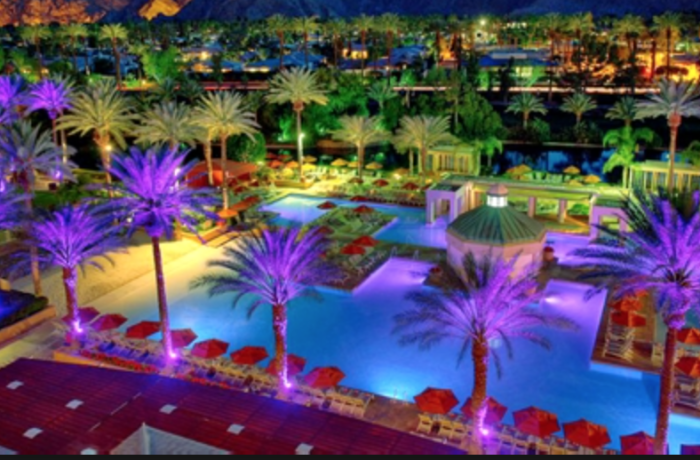 The new Palm Springs keeps the old but brings in the new with modern makeovers for many hotels. There is a feeling of youth in the air as millennials now flock to festivals such as the world’s most famous music festival Coachella, as well as Joshua Tree Music fFestival and Splash House Music Festival which is a yearly weekend pool party taking place ever August over many locations. The Palm Springs area, is centered in the Southern California desert. The area once lured Frank Sinatra and rock 'n' roll legend Elvis Presley who even took up residence here in the late 1960s, honeymooning with Priscilla. In the '60s, glamorous piano bars and retro storefronts lined the vibrant streets of the desert town, which is beautifully bookended by the San Jacinto Mountains. When Elvis and Sinatra left, the city lost some of its spirit. But today, Palm Springs golf courses, pools, spas and nightclubs are attracting travelers, from seniors to hipsters to LGBT couples. I interviewed Jeri Vogelsang, Palm Springs Historical Society, Director and Curator who says the area is definitely on the map full steam ahead. “Palm Springs is happening again. We are emerging as the place to go. We have cultural events. We have beautiful weather. We have the gorgeous natural surroundings. People love to come here to get outside, to partake of the activities. We have events year round that people can choose from whatever suits your fancy, films festivals, walking tours, music, concerts, first class restaurants, entertainment, gambling!” says Vogelsang. I also interviewed for my TV world news report Paul Lewin, Mayor Pro Tempore of Palm Springs who told me the Palm Springs Film Festival really livened things up. “It is hip to be in Palm Springs now or again because as you know back in the 30’s and 40’s we were the playground for Hollywood but then Palm Springs went through a little bit of a rough path and other places were discovered. I think the Palm Springs International Film Festival had a lot to do with it but it still took 25 years from when Sonny Bono started it to where we are today” says Lewin. The Palm Springs Film Festival grew so much that it now attracts major A-list movie stars every January. Today, Palm Springs is rated as one of the top 25 places to visit by TripAdvisor.